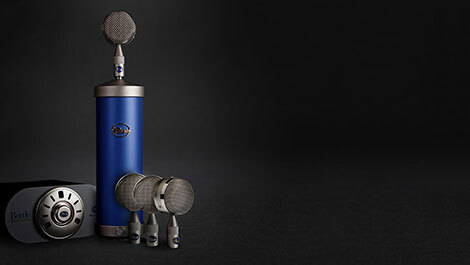 Blue Microphones is introducing Bottle Mic Locker, the world's only complete tube mic locker in one package. Featuring the legendary Blue Bottle tube microphone, the Power Stream variable sensitivity power supply, 4 stunning Blue Bottle Caps, and a custom SKB carrying case, Bottle Mic Locker provides the ultimate artisanal blend of modern and vintage textures for your recordings. Interchangeable Bottle Caps deliver distinct tonal characteristics—like having a mic locker full of tube mics at your fingertips. Bottle Mic Locker enables any recording engineer to accomplish a full vocal mic shootout with just a single mic on a single stand. Simply hot swap between capsules to find the sound that brings out the magic in any vocal performance. If you’re thinking about investing in a new mic, consider the creative power and flexibility that Bottle Mic Locker brings to your studio. Shoot out all four capsules to find the right sound, layer tracks with different capsules for richer, larger-than-life mixes, and explore new tones for your instruments—all with one portable package. The system comes housed in a road-ready SKB® hard-shell case, complete with microphone, four capsules and power supply. Now you can show up to any recording session with your own mic locker in hand.